Even the Beautiful Game isn't immune to the economic crisis, which seems to be worldwide. As such, we are forced to seriously, ludicrously, reduce the price on some current jerseys. 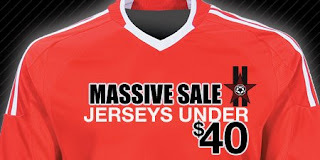 Under $35 for a Man United jersey, in its current season - heretofore unheard of, but it's happened. We understand that you're strapped for cash, but if you happen to have a few $ to spare, maybe from an IRS refund or recent inheritance, you just have to take advantage of these amazing deals, never before seen, and maybe never to be seen again.